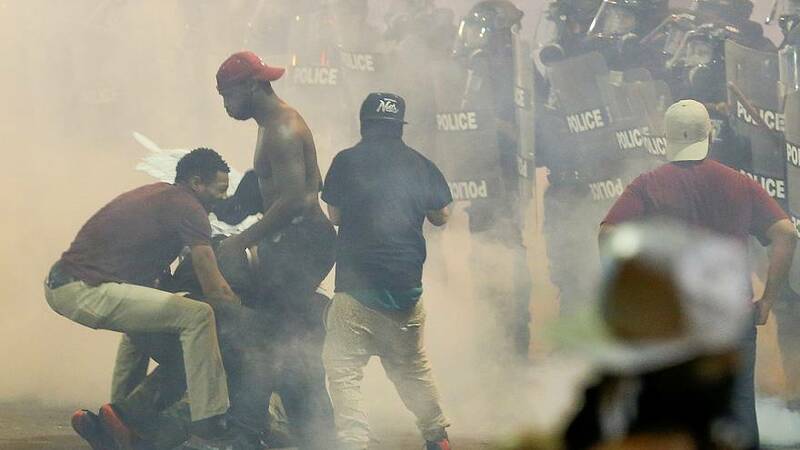 Violence erupted for a second night in the US city of Charlotte following a fatal shooting of black man by police. Protesters once again showed their anger over the death of 43-year-old Keith Lamont Scott who was killed by officers on Tuesday. At one point city hall announced on social media that one person had been taken to hospital and was on life support but was not dead as previously reported. CORRECTIONUPDATE: Civilian who suffered gunshot wound during protests is on life support, critical condition. Not deceased. After several hours of clashes between police and protesters, a state of emergency was declared with the governor of North Carolina announcing that he was sending in the National Guard to help police. Accounts differ over the shooting of Scott. According to police he was armed with a handgun and refused an order to drop the weapon. His family and a witness claim he was holding a book not a firearm. Scott’s death is the latest incident to raise questions of racial bias in US law enforcement. The disturbances in Charlotte unfolded as demonstrators in Tulsa, Oklahoma, demanded the arrest of a police officer seen in a video last week fatally shooting an unarmed black man who had his hands in clear view at the time.